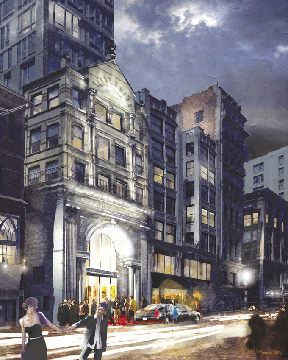 Suffolk University will re-open the Modern Theatre in ceremonies to be held on November 5, bringing a brand-new performance space to the Washington Street Theater District while restoring an important facet of Boston theatrical history. The grand facade of the historic theater, Boston’s first designed specifically for showing movies, has been painstakingly restored, stone by stone. Inside, an intimate jewel-box theater showcases central design elements that are a modernization of some of the most distinctive historic features of the 1914 theater. The state-of-the-art, 185-seat venue will be ideal for live performances, conversations, readings and film screenings. The University will welcome the general public to the new Modern Theatre during a community open house on Friday, November 5, part of a two-day grand opening that begins with a ribbon-cutting ceremony on November 4, for invited guests. Mayor Thomas M. Menino, who has supported the University’s preservation efforts, will be the guest speaker. Upcoming performances at the Modern will include a reading by F. Murray Abraham of "The Last Will " and the Actors’ Shakespeare Project’s production of "Antony and Cleopatra," featuring Paula Plum. The theater will host a documentary film series with DocYard Productions while its Conversations Series will include comedian Lewis Black, Daily Beast political journalist Peter Beinart, author and columnist James Carroll, psychiatrist-author Robert Jay Lifton, and author Maxine Hong Kingston. While the “front of the house” is dedicated to the arts, the building also provides housing for nearly 200 students in a 10-story residence hall built in a setback above the theater and accessed through another University residence hall at 10 West St. With the addition of the new student rooms, the University meets a Master Plan goal of creating more student housing on campus while providing a larger audience for the renewed theater district and other downtown Boston businesses. The Modern Theatre was included on the National Register of Historic Places in 1979 as part of the Washington Street Theater District. In 1995 it was designated a Boston Landmark. The building initially was constructed as retail and warehouse space in 1876, four years after the Great Boston fire destroyed the area. In 1913, it was converted into the Modern, the first Boston theater designed specifically to show films. Under the direction of owner Jacob Lourie, the Modern Theatre became the theater to watch in Boston. Lourie was the first to introduce films with sound and premiered "The Jazz Singer" in Boston. When nearby vaudeville theaters began adding movies to their lineups, he came up with the concept of the double feature – two movies for the price of one – an idea that soon swept the nation. By the 1980s, the building fell out of use and was considered beyond repair. Mayor Menino and Suffolk University subsequently stepped in to save the facade and ensure that a theater would remain on the site. The CBT architectural firm designed the new jewel-box theater and residence hall in harmony with the restored Modern Theatre facade, which was rebuilt in the exact spot where it previously stood. The interior of the theater also draws on the original. Tony-Award-winning theater scene painter and designer John Lee Beatty has created a mural design for the stage house walls, inspired by colors and themes from the earlier theater. The first exhibit in the Lobby Gallery will feature artifacts from the original movie house, vintage photographs of the building, and images of the movie posters and Hollywood stars once featured there.